Modern designers often work with three-dimensional shapes, but all these forms remain on that side of the screen. 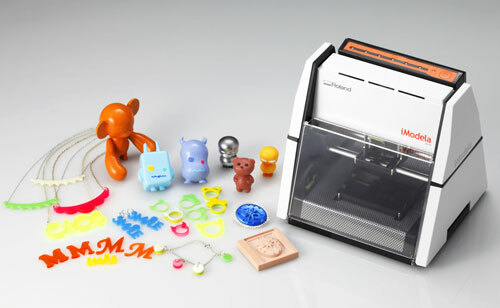 The Japanese company Roland DG released a relatively affordable «3D-printer. However, in contrast to the modern systems it does not make object out of liquid plastic, but rather grind it out from a solid bar of plastic or wood. The machine is connected to a PC via a USB port and displays the “Print” complex models from CAD-files, the device is packaged with programs designed to create and output three-dimensional models. To get the mock-up, the user puts a bar on a special platform, the printer gets calibrated and starts the job. The printing process is time consuming. The model is created on one side only — only half of the figure. To obtain a full three-dimensional object you need to print the two halves and glue them together. Afterwards, you’d most probably need to paint it to your liking. Yes, lots of efforts, but the cost of the printer is only about a thousand dollars.